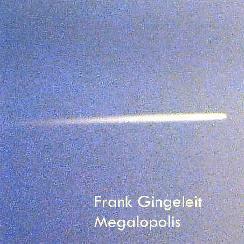 Frank Gingeleit - "Megalopolis" / "Toy Island"
Based in Mannheim, Germany, Frank Gingeleit has demonstrated in a very short time that his fans can never approach a new recording with preconceived notions as to what to expect based on past experience with his music. Frank's first CD, Nightmares & Escapades, was an avant-garde electronic exploration that I described in my review as "a somewhat more experimental version of Ash Ra Tempel with doses of early 70's German electronica" (see AI #21). Having already released a second CD ("Megalopolis") and a third coming in May ("Toy Island"), Frank is proving to be a talented and creative musician with a diversity of stylistic interests. He approaches each release with a stylistic theme in mind, hence the variations among projects but consistency within each recording. The technical difference between Nightmares & Escapades and Megalopolis is whereas the former relied solely on guitar, guitar synthesizer, effects, and analogous 8-track mixer connected with a digital recorder, the music on Megalopolis is created exclusively with the virtual analogous synthesizer. The promo sheet for the album notes that the obvious points of reference for the music are Klaus Schulze and Tangerine Dream, and this hits the nail right on the head. Fans of this style of space electronics will be delighted with Frank's ability to paint meditative but meticulously detailed cosmic landscapes that offer brain massaging for those who wish to get lost in the music but much to reward the attentive listener. Classic Tangerine Dream styled syncopated patterns serve a rhythmic role, keeping a steady pace but also adding character and energy to the music, as the floating electronic waves and textures lead the listener down a freeform but determined path. Headphones are absolutely essential to benefit from the music's opium den seductive powers, but also to really pick out all that is happening despite the astral flow. The tracks are all in the 6-8 minute range, which may not constitute lengthy excursions though it does allow the music plenty of room to stretch out and develop. But it's no matter because most of the tracks segue seamlessly from one to the next, essentially giving us a full 50 minute journey into cosmic and majestic electronic space. Three standout tracks which are among my favorites are the title track, "Megalopolis", "Bad State Of Mind" and "Adjust Your Clock", all of which include the most high energy music and moods on the album. "Megalopolis" contains all the same elements heard on the rest of the album, but it also has a cinematic quality, not unlike that heard in much of Vangelis' music, though Frank is far deeper into the more lysergic reaches of space. And "Bad State Of Mind" would make a killer soundtrack to a high adventure sci-fi film or television show. The varied and exciting synth patterns will keep you wide eyed and on edge, clutching your seat as your spacecraft twists and turns at warp speed. Overall, fans of the German school of space electronica are pretty much guaranteed to enjoy Megalopolis, as Frank draws heavily on that genre while managing to keep his interpretation of the music fresh and exciting. On his latest album, Toy Island, Frank explores very different territory, his intention being to bridge the gap between avant-garde music and modern popular music. To this end, the instruments used on the album include guitar synthesizer, a key-based synthesizer and an arranger keyboard designed for dance music. 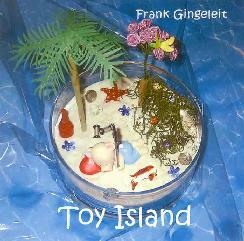 Though meant for adult listening, Frank had the world of children and their perceptions very much in mind when conceptualizing Toy Island. As he says on his web site, "I consciously avoided planetary, martial or psychedelic titles for the single tunes. I think that many thoughts and feelings of children have a psychedelic beauty without drugs or adult freakiness". Though Toy Island includes elements of pop music, this is hardly something you can expect to hear on the radio any time soon. I think it's mostly Frank's use of dance rhythms and Dub sounds that give the music an accessibility that might be considered as having pop potential. But make no mistake... the freaky meter is running high throughout the album as Frank combines a variety of sounds and stylistic elements. "Toy Island Part One" opens the set and blends dance rhythms and a heart thumping bass beat with a very cool alien synth melody that guides the direction of this slowly evolving tune. Toy Island Part Two" is a remix of part one with only the rhythm tracks changed, giving the music a more off-kilter Dub sound, which actually sounds nicely strange combined with the synth melody. I like it. "Ducklings And Polar Bears" is similar and has one of the catchier cosmic melodies of the set. "Counting Sheep" has repetitive electronic and percussive patterns that are semi-dancey and even oddly jazzy. But there are also waves of ambient space continually drifting and phasing through that add a tension to the music that is in stark contrast to the quirky rhythms. On "Talk With Your Children", the "talk" between parent and child consists of efx'd voices speaking in an imperceptible but very cool sounding alien language. Perhaps people of other planets have got this child raising thing down better than we do. Lots of fun freaky bleeps and pops on this one, which sound all the more wild given that the ambient space waves and tribal beats keep their steady pace throughout. "Free And Easy" is like a dance party with the Beat generation in an alien jazz lounge. I love the deep Dub elements and spaced out synth noodlings whose strange dance fits the atmosphere perfectly and continues the unlikely but imaginative combinations that seem to be a trademark of the album. "Witchcraft Lessons At A Dwarves School" is one of the more purely spaced out tracks of the set, but also one of the most intense, with it's bass beats that cause an eruption felt from the heart all the way up to the cranium, and its penetrating synth lines, some of which weave their way snake-like through your brain, and others that rain down like a meteor shower. Finally, "Hot Socks" is the one track that has the most pop potential. It has the most even paced dance rhythms, but is no less freaky than the other tracks. In summary, I think Toy Island is just as much a departure from the norm as Nightmares & Escapades was, with it's often strange mixture of differing sounds and styles. As I told Frank in personal communication, I believe that it's just as challenging to make creative and well thought out pop music as it is to make challenging avant-garde and experimental music. Kudos to Frank for successful missions to the various corners of the universe he has chosen to explore. I'll look forward to the next journey. For more information you can visit Frank Gingeleit's web site at: http://frankgingeleit.beep.de.